After twenty years of unprecedented growth, the 2018 Oregon blueberry crop is looking good and will likely set another record. Freshly harvested Oregon Blueberries is one of the joys of summer and Oregon growers are expected to harvest more than 130 million pounds of blueberries this year, another production record. A bumper crop of fresh blueberries is good news for customers who have increasingly become aware of the advantages of buying local and buying fresh. While we tend to think of Oregon blueberries as simply a tasty summer treat, blueberries have been named the star of Super Foods for a healthy mind and body. 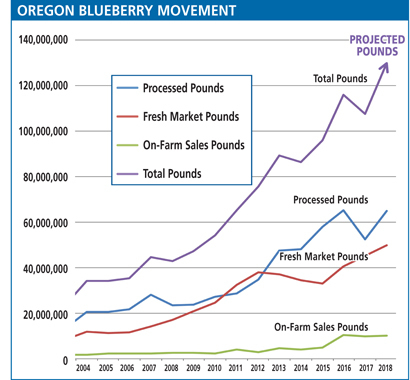 It’s the Super Food designation that has driven Oregon blueberry production and sales increases in recent years. With such large production numbers, Oregon remains one of the top producing states in the nation. Fresh Oregon blueberries are a hot commodity these days for a lot of reasons with incredible taste, the highest quality and high nutritional value being just a few. With Mother Nature’s help, Oregon growers routinely realize the highest crop yields per acre compared to any other state, an estimated 20,000 pounds per acre or more. Oregon farms range from large operations that ship their crop to both national and international buyers to small family farms with less than ten acres offering on-farm sales. While Oregon blueberries may have advantages when it comes to taste and quality, it’s the international interest in nutrition and healthy eating that have fueled the growth. In general, blueberries are a very rich source of antioxidant phytonutrients. Antioxidants refer to the negative oxidation properties or compounds found in blueberries. Certain natural fruits and vegetables supply the body with chemicals which react against particularly harmful oxidants associated with elements (“free radicals”) which can damage a wide variety of functions and internal processes. Just one-half cup of blueberries helps you on your way to meeting the USDA’s recommended goal of five to nine servings a day of fruits and vegetables. The Five-a-Day The Color Way program suggests that to achieve optimal health benefits, we should choose colorful fruits and vegetables daily from each of the five color groups. Blueberries are a proud member of the Blue/Purple group. Research shows that blueberries contain natural compounds that help our bodies stay healthy and may help prevent age-related diseases, including Alzheimer’s, macular degeneration and some forms of cancer. With only 40 fat-free calories per half cup, blueberries are also a great source of fiber and Vitamin C. A serving of blueberries is a quick way to help meet the USDA’s recommendation of colorful fruits every day. If you’re interested in additional information on the Oregon blueberry industry, harvest, marketing or blueberry nutrition, just give us a call. The more you know about the benefits of Oregon blueberries, the better you’ll like them. Oregon Blueberries … it’s a great story.